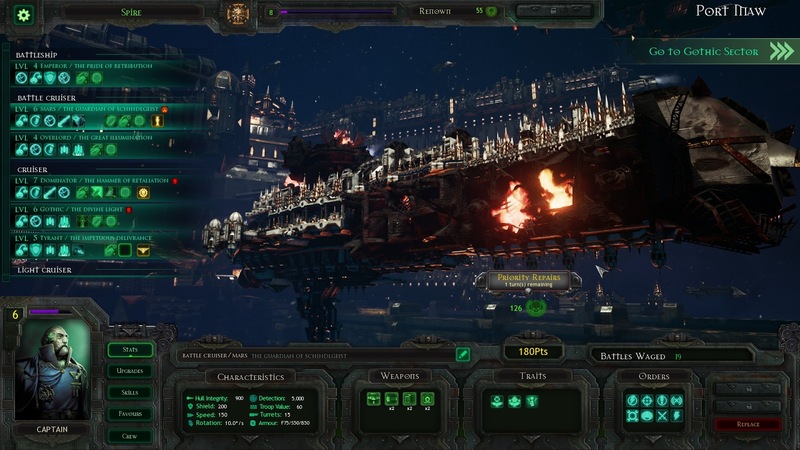 The 12th Black Crusade has begun, the Gothic sector is besieged, and suddenly the tormented embrace of the Immaterium hellscape doesn’t seem quite so terrible. Perhaps the terrors of the warp are worth risking to escape the material dark; the horde of Abbadon the Despoiler, the lunatic Greenskin menace, and the sleek swords of the Eldar. The brooding, gothic darkness of the Warhammer 40,000 universe has rarely been captured so purely. 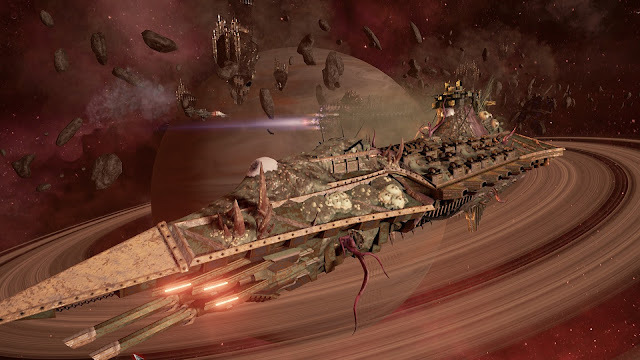 The essence of Battlefleet Gothic: Armada is, I believe, as refined as that of Relic’s venerable Dawn of War series, the scale however is quite different. In Battlefleet Gothic you command fleets of warships, not squads of Astartes, defend whole sectors, not merely outposts. The essence of which I spoke hangs between the wrought spires of the Imperial Navy cruisers, it oozes from the ever-undulating skins of the possessed hulls of the dreaded Chaos armada, it’s an intoxicating melange of visual, auditory, and written flare. Unlike the retired table-top game from which it draws its name and much of its design – having never played the original game I am speaking only of surface details; visuals, combat capabilities, weapons, and so fourth – Armada’s battles unfold in real time. Engagements are high speed affairs that demand keen senses and which decision making. Broadsides, prow bombardments, boarding actions, strategic/suicidal ramming, you’ll do all – you have to do all, often simultaneously. Every ship has a point value, each battle has a point limit; you may only lead two or three ships into a given battle, your whole fleet may comprise of perhaps a dozen. This may sound acutely limiting, boring even, yet in my experience every battle is a frantic click-fest, frequently difficult ones at that; only the initial tutorial missions may be described as ‘easy’. Getting to grips with Battlefleet Gothic can be tough, particularly in the early going. Between pre-release builds and the shipped game, I’ve played around fifty hours, at the time of writing, and felt at least competent for about half of them; in those first few hours, it was all I could do to escape total eradication in every battle I fought. Part of its high barrier to entry is the pace, but mostly I attribute it to the tightness of the ships and combat mechanics. 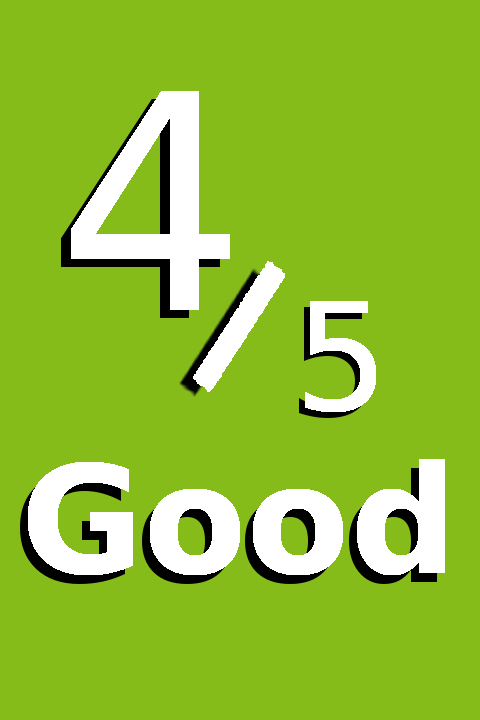 You are not afforded much room for error; combat is fair, the enemy AI plays by the same rules, but unlike you it doesn’t have to try to remember the effective ranges of a half dozen weapon types at any given time. 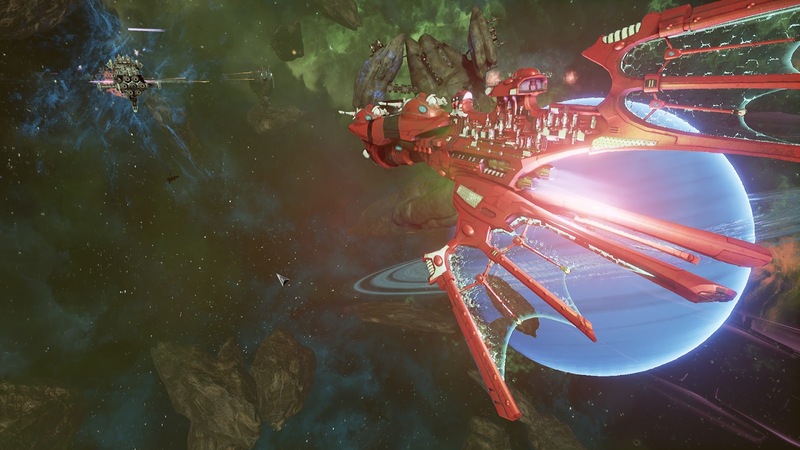 The game does little to school you in such matters; dialogue in the campaign will tell you Eldar ships are fast and that Macro cannons are poor at long range. I firmly believe however, hours at the helm are needed before one can truly learn how to exploit, or conversely manage these concepts. This is not a strategy game like Starcraft, one whose gameplay is simple on the surface with the true depth experienced only by those who dedicate themselves to it. No, Battlefleet Gothic requires some understanding of its complexities to make it through battles on even the easiest difficultly setting. Now that is not to say I think this game is categorically hard, rather it requires its mechanics to be explored and practiced. It is the double edged sword, almost as old as the medium; the game asks you to put in the work, to thus be rewarded, but that work may be more than you’re willing to undertake. The pace of the combat can be slowed at any time, through the ‘Tactical Cogitator’ – each playable faction has an equivalent – though it never stops completely. This is essential to managing multiple ships simultaneously, which is in turn crucial to securing victory. There are various engagement options; desired range, desired use of prow or broadside weapons, passive buffs, active abilities, speed and directional controls, and more. Key to ship movement are the manoeuvring options, that manifest quite differently in the case of the Eldar ships, for most factions though these allow sharp turns and dead stops into or out of danger, limited by their own associated energy pool. In short there is a lot to do with any ship at any time, and again, if you want to win you have to learn to do most if not all of it. There are four factions; Imperial Navy, Chaos, Orks, and Eldar, each with distinct play styles. Ships are spilt into classes from nimble and expendable escorts, up to death dealing battleship behemoths. Within these classes there are numerous ship variations; similar designs with different armaments, and therefore different applications in battle. Each ship, with the exception of escorts, can be renamed, levels independently, has technology and crew upgrades, unlockable abilities, and in time can be awarded favours – alignment to various parties or gods within its respective faction. Sadly, while there are individual captain portraits, there is no captain progression, they are not even named. The breadth of your fleet and the ships you can recruit, increases as your admiral levels up, there are separate fleets in multiplayer, single player skirmish, and campaign. Fortunately, you don’t lose these ships entirely if they explode in battle, or their captain turns traitor, they may be out of action for a couple of turns and costly to repair though. You can save your ships from temporary destruction by ordering them to flee from battle, though you do run the risk of them being waylaid in the tempestuous warp however. In both the campaign and multiplayer there is the concept of turns between battles, so having your heavy hitters out of action for a turn or two could spell disaster for future battles. In the multiplayer and single player skirmish you can take command of any faction, each with their own fleet progression and stylised interface, the campaign is a strictly Imperial affair however. 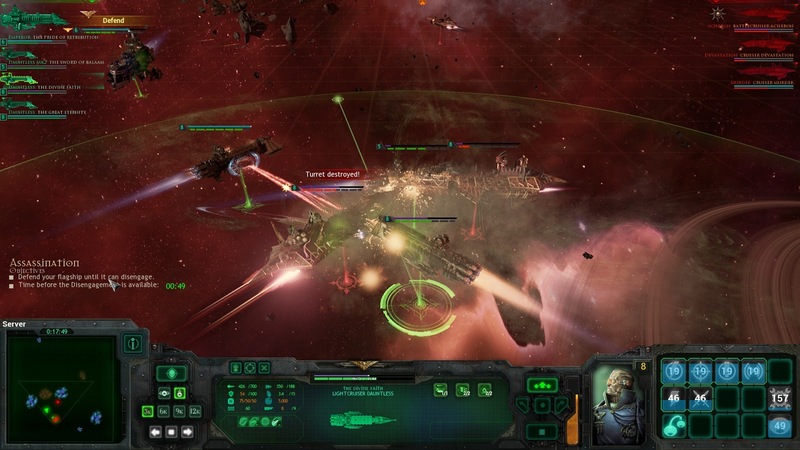 The campaign features an XCOM-style strategic layer, hence the turns between battles. As the earnest Admiral Spire, you attempt to defend the fifty star systems against the decadent heretics and foul xenos, each system yields certain resources and thus not all are of equal strategic importance. There is story, a light narrative, providing context more than anything. It is well written for what it is, demonstrating a keen diligence in its use of the Warhammer 40000 lore, though there are some issues with the games’ English text here and there. 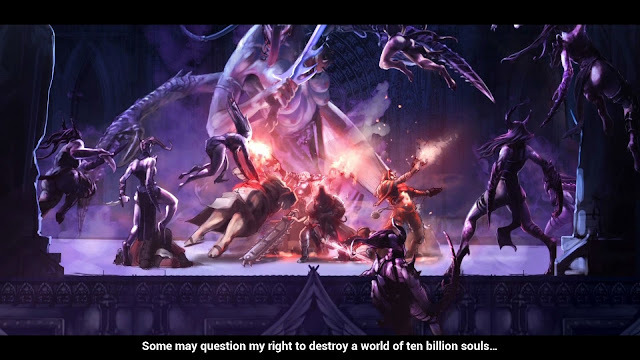 The campaign has a decent number of crafted missions and set piece moments; you’ll engage Abbadon’s Planet Killer, for example – assuming you hold out that long. Most battles however fall into the same half dozen objective types; straight up clashes, to the more asymmetric assassination and data acquisition missions, where guile is valued above firepower. These missions are by their very categorical nature repetitive, though I haven’t yet tired of them; they continue spawn challenging combat scenarios. 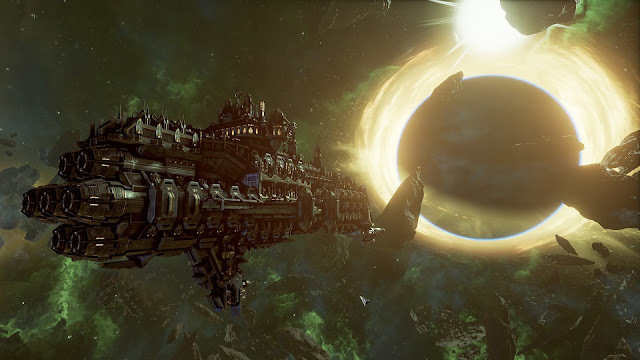 Battlefleet Gothic: Armada is an excellent real-time strategy game, with high-energy combat mechanics, that are demanding both to learn and perform. Its four factions are as fun to get to grips with as they are fearsome to fight, whether helmed by the AI in the campaign or skirmish, or by other players in multiplayer. Battlefleet Gothic: Armada makes superlative use of the Warhammer 40000 license, and looks awesome doing it.